We all know what a phenomenal success the mobile application market has been since it was first introduced to the world at a large scale by Apple following the launch of the iPhone and iPod Touch. Since then numerous other mobile systems have followed suit, creating an industry that today is making app developers millionaires. Renowned research company Forrester earlier released a report that suggest that the revenue from apps will reach $38 billion by 2015. 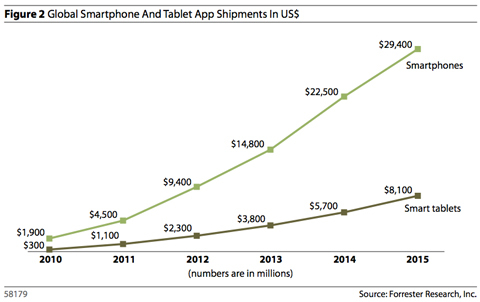 That number is based on customers downloading and paying for apps for smartphones and tablet style devices. They go on to predict that companies will spend more than $17 billion on developing these apps, so there are gold in them hills for those that are in the app development industry, perhaps one of the fastest growing economies we have at the moment. The recent years growth in tablet style solutions, starting with the Apple iPad and following on with a myriad of Android based tablets, will alone deliver $8.1 billion in app sales by 2015, a big jump considering it delivered about 300 million for 2010. The prediction is that more and more apps will take advantage of the cloud in the future, basically allowing you as a user to have all your files stored in the cloud/online, and easily being able to access them from any device at any time, based on being connected to the internet in some way or another. When did brands become our friends?